What cool badge queries have you come up with? Unless you’re on a site that we host in which case you won’t see it by default. Can this be configured to be Category specific instead of Topic specific? Yes. You can issue a badge for whatever SQL you can write that doesn’t crash your server. Is there a database diagram anywhere? I know how to write SQL, I just don’t want to query in the dark. This topic and the Data Explorer Plugin are your guides. I keep getting the following error when running these queries. Any help appreciated. Can you post the query that you are trying to run? I’ve hence realized that the backfill is just for when the badge query is running and not to use that wile using the data explorer. BUT I tried setting up a badge using the query above and to run the query after a post processed and then had one of my teammates test it and it didn’t give them the badge for posting in the introduction topic. Alright, so my company wants to focus on the amount of activity individuals spend in each category. Below is the query I came up with. If I set this for the badge query will everyone that fits the qualification get the badge? 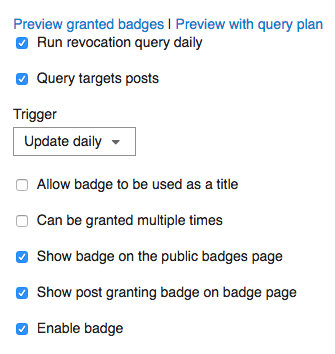 With the new SQL rules, how would you make a badge for introducing yourself on a topic? Here’s a badge query for someone who replies to a post in a category (id=19). The post_number > 1 makes sure that it’s a reply, not the first post. Hi, is this still the way to add custom badges? I can’t see a place to add SQL code when I’m creating one. thanks! 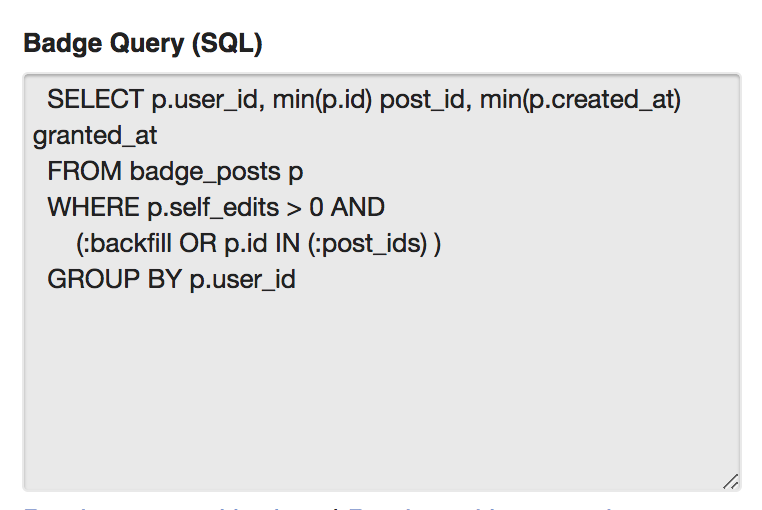 badge sql is disabled via site settings out-of-the-box cause often people make very bad sql choices. This code give every user who logs in between ‘Day of Year’ = 358 and 2 days into the new year a badge. Word it as you like! What I’d like it to do is award the badge every day they visit between the two dates. Help please! I think if you add another field like the “visited_at” it woks. Because you’re using just user_id and current_timestamp, and they are distinct just in user_id, because current_timestamp would be the same every row. If you add visited_at they could be distinct, and them one badge for every day.